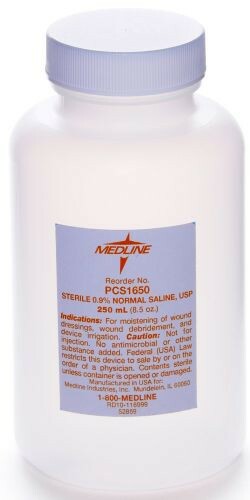 Sterile Saline Solution by Medline is an isotonic mixture of salt and water to serve many wound applications. Sterile saline is the standard when it comes to wound cleansing solutions because it's gentle to the damaged tissues, non-toxic and above all, sterile to not spread microorganisms to not impede healing of the wound. 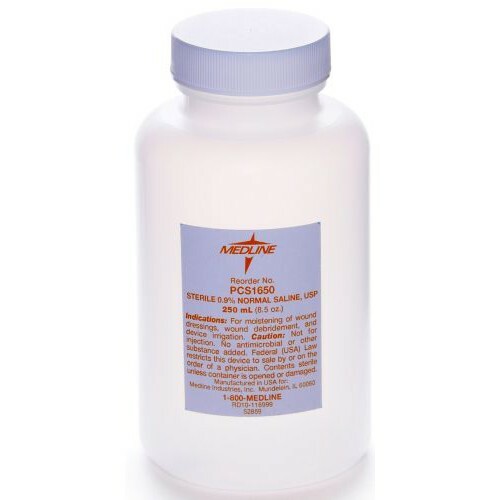 The cup size bottle is convenient for suctioning to directly flush or irrigate a wound, cut or abrasion to remove dirt and other foreign bodies. Medline Sterile Saline is also used to remove unhealthy tissue from chronic wounds to promote healing. It's also ideal to soak or moisten wound dressings with saline solution to prevent dressing from sticking to the wound. The 100 mL bottle is small enough for one time use to be mindful of waste with larger volumes. After opening, quickly use the solution to reduce the risk of contamination. Volume: 100 mL; 3.4 oz., 250 mL; 8.5 oz. Note: This Sterile Saline is NOT to be used for injections.